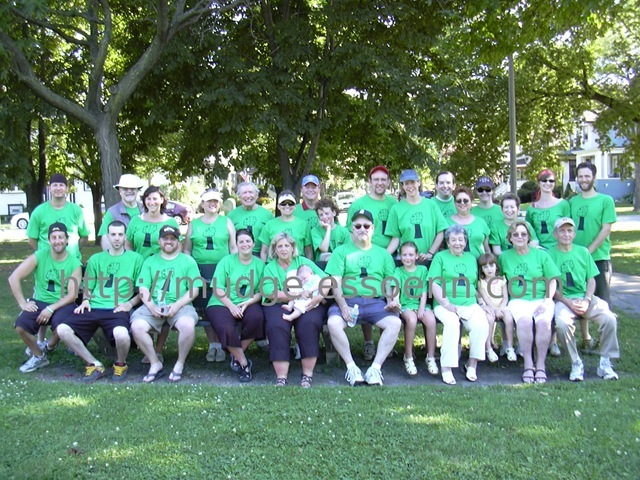 That group of 28+ verdurous folks smiling at you were posing at our reunion weekend picnic in a clean and well maintained Chicago park this past Saturday afternoon. The photographer was MUDGElet No. 3’s new serious girlfriend, so new that we didn’t have a green shirt (designed by a 10 year old cousin and her seven year old sister, members of Generation 4) for her, and the lack of appropriate uniform, and the newness, made her the logical choice for portrait photographer. We had a wonderful weekend with these four generations of my wife’s extended family: mother, aunt and uncle, first cousins, first cousins once and twice removed. Most still live here in the Chicago area; groups flew in from Houston and Philadelphia. Some were missed: a cousin (once removed) in Vancouver; and MUDGElet No. 1 and her husband and our grandchildren, who were participating in his family’s Hawaii vacation. The elderly (clunky, and so slow) Nikon Coolpix 2000 camera takes indifferent photos when yr (justifiably) humble svt is personning the viewfinder, but does much better when Mrs. MUDGE is handling the honors (or the lovely V__, as the group shot above demonstrates), which Mrs. M. did quite capably for most of the 70+ shots we collected over the past four days. So, I spent the evening uploading the results from the memory card to my PC via Picasa (deftly dealing with some inevitable redeye in some of the indoor shots), thence to Shutterfly, where, after some cropping, 67 of our best efforts were compiled in an album for the edification of the family. All this, instead of blogging, of course. But, that S__ family, particularly, is worth it. This entry was posted on Monday, August 4th, 2008 at 10:59 pm and is filed under Life. You can follow any responses to this entry through the RSS 2.0 feed. You can leave a response, or trackback from your own site.